(Not So) Random Film of the Week: GOG | "DESTROY ALL FANBOYS!" 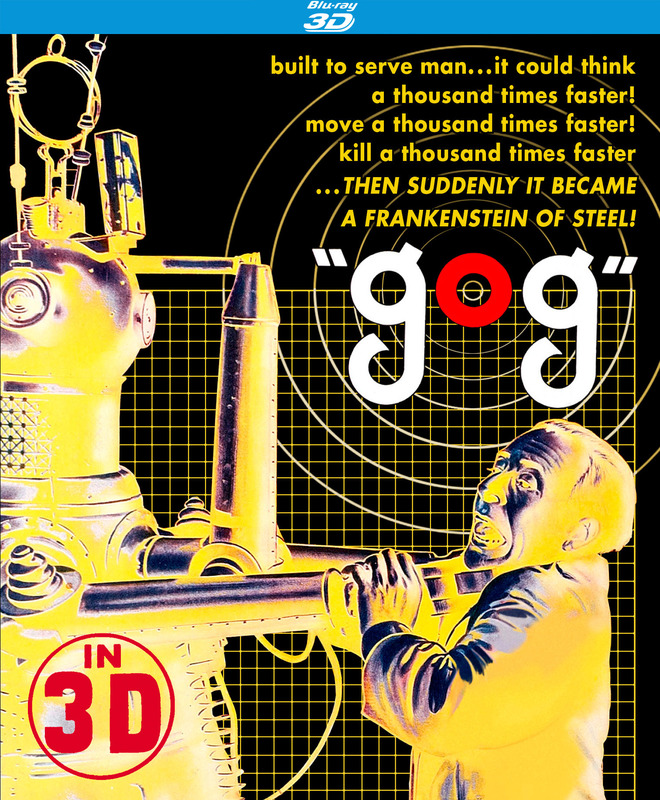 GOG, the third OSI film, was the only of the trilogy to be filmed and originally presented in 3D, but until the recent (and outstanding) Kino Lorber Blu-Ray release, the film has only been seen in its “flat” presentation and until this version, usually in imperfect prints. The Kino Lorber disc is a must, particularly if you enjoyed it but only remember that lousy TV print. Fans of The X-Files or sci-fi anthology shows such as The Twilight Zone or The Outer Limits may find unraveling the mystery happening under the New Mexico desert makes for a compelling time in front of the tube whether seen flat or in glorious 3D. The film also has light elements of horror as a number of researchers are killed in somewhat frightening (albeit bloodless) ways as things go from bad to worse. After a number of employees working on a top-secret space project are brutally murdered by a few means, OSI’s Dr. David Sheppard (Richard Egan) gets called in to see if he can figure out what’s going on. Joined by onsite OSI agent Joanna Merritt (Constance Dowling), the pair find out it’s the base’s massive computer NOVAC is under control by an outside force and has been whittling down the base staff at every possible opportunity. Nope, OSHA does not approve of workers dying from being frozen to death and shattering into icy chunks, getting tuning forked to death, or mutilated by a pair of suddenly turned killer robots with biblical apocalyptic names. GOG and MAGOG are the pair of corrupted metal killers NOVAC sends after the base’s nuclear reactor, and it’s up to the OSI agents and a few hardy scientific souls to prevent things from going kablooie. Will they succeed, or will things underground go even further down in flames? Well, you woke up breathing this morning, right? SCIENCE! The film builds its suspense right from the beginning and Herbert Strock’s straightforward direction works very well in setting the mood and there’s a certain verisimilitude to the sets and costume that give the film a solid sense of reality. Yes, here are fancy-looking gadgets, gigantic mirrors in the desert and even an “invisible” plane here. But remember, it’s science fiction, but with a more scientific take than the usual drive-in creature feature. The more cerebral script and drier pacing outside the frantic parts may take getting used to for some younger viewers, but if a serious film with a sci-fantastic edge is what you’re looking for, this one’s a great watch with a few like-minded friends. The Blu-Ray is also worth a buy for the special features which include some great interviews and a fantastic look at how the film was restored from a washed-out mess to the glorious, radiant new version with color and detail popping whether in 2D or 3D versions. While Kino Lorber also has The Magnetic Monster on Blu-Ray, Riders to the Stars is sadly, not to be found in HD at this point. If I’m not mistaken, TCM occasionally shows this, but my current source is a somewhat mushy quality triple flick DVD I dug up after a search some years back. Hopefully, a print of that film can be unearthed and restored at some point, as all three would make a mighty fine box set, right Kino Lorber? Heck, given Tors’ other contributions to TV and film history, I’d say the man deserves some sort of documentary look at his body of work and all the entertainment it’s influenced up until this point. Just let’s not have a Hollywood biopic, as those are all pretty much badly structured fantasy as opposed to anything resembling the best of what Tors created. Hey! This post is part of the Keep Watching the Skies! Science Fiction Movies of the 1950s Blogathon!, held by The Cinematic Frontier. Go boogie on over there starting 9/26 to read more (and better written!) takes on many 50’s sci-fi classics from familiar to obscure. I think this one is somewhere in the middle of that list, but if you’ve never heard of GOG before, well… that means it’s all new to you and you should check it out some time, correct? 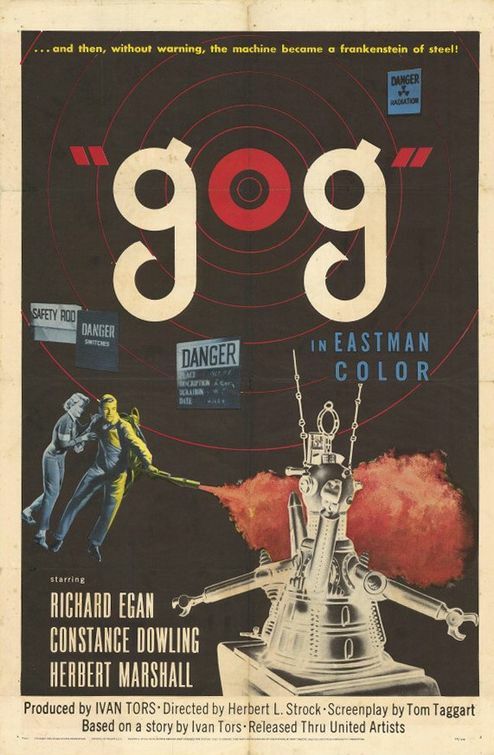 This entry was posted in 2016, Commentary, DAF, Features, Humor, Movie Posters, Updates and tagged "gog", 1953, 1954, 3D, 3D Movies, Blogathons, Blu-Ray/DVD, Classic Film, Classics, Commentary, Humor, Keep Watching the Skies! Science Fiction Movies of the 1950s Blogathon!, Kino Lorber, Movie Clips, Movie Posters, Movie Trailers, Movies, OSI Trilogy, Random Films, Riders to the Stars, Sci-Fi, The Cinematic Frontier, The Magnetic Monster, YouTube by geelw. Bookmark the permalink. It’s the best of the three, I think. The restoration job REALLY makes the film look gorgeous. Riders to the Stars needs to be done up like this, but I don’t know if there’s a workable print available. Thanks for stopping by and reading! I’d be interested in seeing this if it’s available in non 3-D format. (I lost most of my left eye to glaucoma. 3-D only gives me a headache…) Sounds really interesting. You’re in luck! The disc has both versions on it. I’ll add that to the post within the next hour or two… thanks for stopping by!